Got a big stack of wedding thank-you notes to write? Congratulations, newlywed! It means you’ve got a lot of people who care about you. It’s a good problem to have. Getting started can be daunting, but don’t sweat it. The honeymoon doesn’t have to end just because you have your note-writing work cut out for you. Keep reading for inspiration and message ideas from Hallmark writers to help take you from “dreading it” to “did it”! 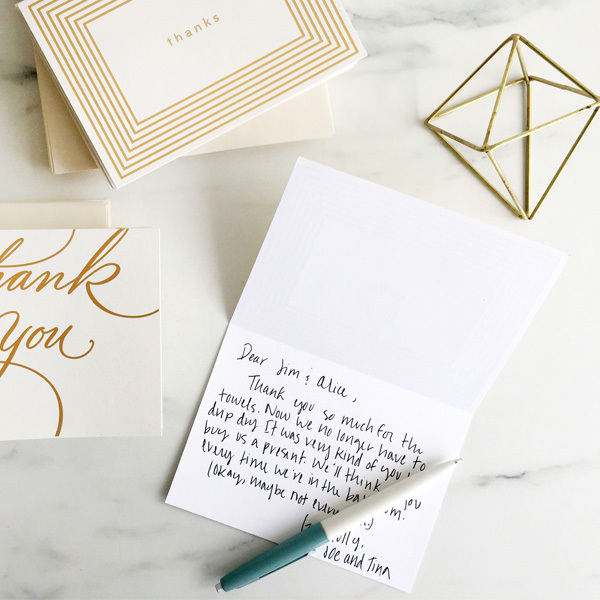 While weddings themselves might not be the traditional affairs they once were, wedding thank-you notes are timelessly thoughtful, classy, and just as meaningful as ever. At a bare minimum, a wedding thank you acknowledges that you received a gift or kindness, and reflects the time and thought that went into giving it with some corresponding effort of its own. That all by itself is important. But at their best, wedding thank-you notes can remind a friend or loved one how much they mean to you and thank them, not only for adding to your big day, but for being part of your life. And that’s more than important—it’s essential. It’s taking good care of the people who mean the most. Stock Up— Ideally, you’ve settled on stationery for your thank-you notes kept track of addresses after sending wedding invitations. You’ll also need a supply of stamps—and a self-address ink stamper or labels might just become your new best friend. Time It Right— It’s good etiquette to send wedding shower thank-you notes within two weeks of the shower, and wedding thank-you notes within three months of the wedding. Aim for those time windows, but remember, late is always better than never. Divide & Conquer— Split up the thank you writing over multiple days, and also divvy it up between the two of you. It probably makes sense for each partner to write mainly to his or her friends and family, but you could also split the writing work purely 50/50. Or, if you want to up the team-spirit factor even more, you could both write a little something in every thank-you note. Thank you so much for the terrific cutlery set you gave us for our wedding! It’s already coming in handy with meal prep, and the knife block looks sharp on our kitchen counter. We’re touched by your thoughtfulness, and thrilled that you were able to make it to the wedding, too. Having you there to share our special day with us meant so much to us. Thank you again! How did you feel when you opened the gift? What plans do you have for it? Why is this a good choice for the two of you? How will the gift make some part of your life easier, prettier, or better? The main difference here is calling out the shower as the occasion for the gift. If you can possibly manage it, get your shower thank-you notes written before the wedding. Your future married self will thank you! Just writing to tell you how much I appreciate your fabulous shower gift! I was so excited when I opened the essential oils and diffuser—and the way you pulled it all together in the gift basket was so creative! You’re amazing. It was great catching up with you at the shower. Thanks for being there and making it so special! Thank you for chipping in on the group gift for our couples shower! We can hardly wait to try out the new lawnmower. You guys are great friends! With an open-ended gift like this, it’s a nice touch to mention your general plans for it, but not absolutely necessary. Rather than stating the specific amount of money given, you can just refer to the generous gift or gift card. Trey and I are so grateful for the generous hardware store gift card. We’re moving into a bit of a fixer-upper, and this will help us so much. It means a lot to know you’re thinking of us and wishing us well as we start out together. Thank you again for your thoughtfulness! Thanks so much for the very thoughtful wedding gift. Couples can always use a little help getting started on their new life together, and we’re no exception. Your caring means a lot to us. And so do you. Writing-tip: Double-check that you’re using the correct form and spelling of your recipients’ names. When in doubt about what level of formality to use, opt for your recipient’s last name with the correct title (Mr., Mrs. Miss, Dr.). Sometimes a guest’s presence is the wedding present, and that’s worth a thank you, especially when they’ve traveled or made a special effort to be there for you. From the bottom of our hearts, thank you for going out of your way to be at our wedding. It meant so much to look out and see your smiling face in the pews, and to have a chance to talk and catch up at the reception. We can’t tell you how much we appreciate it. Our big day was even more unforgettable because you were there to celebrate it with us. Wow! Our wedding day went by way too fast. It was so fun to celebrate with all of our friends and family. We hope you had fun and we want you to know how grateful we are that you were a part of this day that was so important to us. Taking part in a wedding can mean a big investment of time, energy, and support. That’s why bridesmaids, groomsmen, ushers, attendants, and other helpers deserve a warm thank-you note. Having you in our wedding means so much to us. Your smiles, your words, your hugs—they all made our magical day even better. We loved having you there to share in the celebration. Everything about the wedding was better because of you. Thanks for being an important part of our special day, and the best maid of honor ever! What a great wedding day we had! But it wouldn’t have been complete without you—our usher extraordinaire! Thank you for all the big and small ways you helped out, and for all the laughter and energy you shared. You’ll always be an especially fun part of our wedding memories. These wedding thank-notes might go to friends or family who helped manage the little glitches and big moments of the day, or to the photographer, stylist, or other wedding pro went above and beyond for you. Joel and I are really lucky to you in our lives, and happy we can both call you family now. Thanks for being an unforgettable part of our day. I just wanted to take a moment to thank you for your expertise in planning and pulling our wedding day together! It went absolutely beautifully, down to the littlest details. It was a dream-come-true day for Zach and me, and I know it wouldn’t have been possible without you. Thank you for going above and beyond for us! Writing-tip: For a wedding professional, a glowing public review and promise to recommend them couldn’t hurt either. “Thanks, Mom/Dad.” You’ve probably said it to them in person already, but for an occasion this special, it’s worth putting in writing, too. I can’t fully express what your support, encouragement, and advice has meant to me these past few months! It was such a comfort to know that no matter what happened, you two were always there for us. Our wedding was a day that Marco and I will never forget, and a big part of that was having you by our sides: walking down the aisle, toasting with us, celebrating with us. Sure, a wedding is about two people who love each other, but it’s also about everyone who loves those two people. We are two lucky people to have parents like you with us on this ride called life. Thanks again, from the bottom of our hearts, for everything!